The initial setup of CubeBackup is a little complicated, and some of our users might run into the “Google Apps authorization failed!” error when clicking the “Test” button in the initial configuration of CubeBackup. NOTE: The following items are listed in descending order of likelihood. 1. In a few cases, G Suite domain-wide authorization needs some time to propagate. So you can just wait for several minutes and then click the Test button again. 2. Are the Admin SDK, Drive API, Calendar API, Contact API and Gmail API enabled in Google API console? A quick way to confirm: all of the above APIs should be listed in API Manager -> Dashboard -> Enabled APIs. 3. The Client Name in your Google App/GSuit admin console -> Security -> Advanced settings -> Manage API Client access should be the created Service Account’s client ID (e.g. :10847638222459), not an email address. 4. Make sure that “Enable API access” is checked in Google Apps admin console -> Security -> API reference -> API access. Generally, “Enable API access” is checked by default. 5. If your computer is running a fresh installation of Windows 7 or Windows Server 2008, and you have not installed all of the updates, the problem may be that you are missing hotfix KB2468871 for the .Net Framework 4.0. Download the hotfix here, and install it. You may be required to restart your computer before the update takes effect. 6. 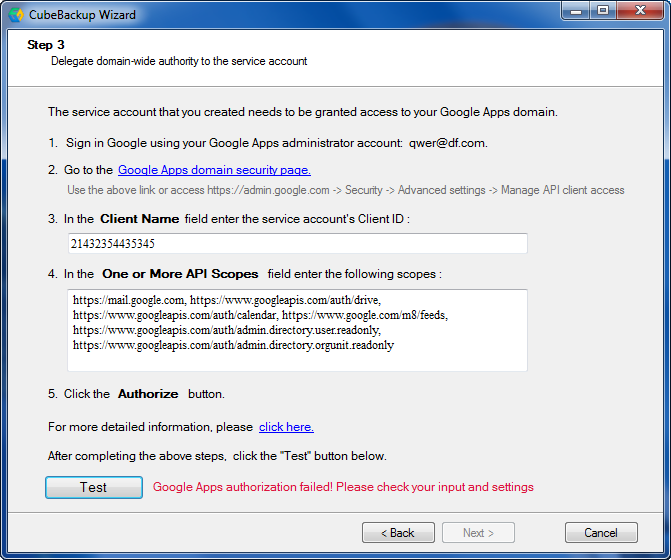 Please ensure that www.googleapis.com port 443 and imap.gmail.com port 993 are not blocked by your firewall/proxy. 7. Try CubeBackup on another computer to see if it works there. Finally, if you’ve tried all of these and the problem persists, please contact us (support@cubebackup.com).